Biography and Altarpieces of Austrian Painter/Wood-Carver. religious paintings of the 15th century. One of the great Old Masters of the early Northern Renaissance, the Austrian artist Michael Pacher spent the bulk of his life as a sculptor and painter in the south Tyrol. Curiously, while his wood carving - like that of his contemporaries Hans Multscher (1400-1467), Veit Stoss (1447-1533), Tilman Riemenschneider (1460-1531) - exemplified German Gothic art, his painting is strongly reflective of the Renaissance in Florence and introduced a wide range of German-speaking painters to the new techniques of Renaissance art. 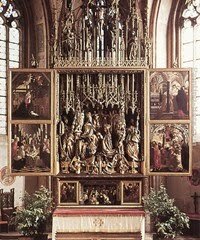 In sculpture, his greatest masterpiece is The St Wolfgang Altarpiece (1471-81) for the church of St Wolfgang on the Abersee, in Upper Austria. In painting, his most famous masterpiece is The Altarpiece of the Church Fathers (1483, Alte Pinakothek, Munich). On the face of it, for someone who spent most of his life executing commissions for small local churches, his influence on the painting of the German Renaissance and his production of one of the greatest pieces of wood-carving ever, seems quite extraordinary. Little is known about Pacher's upbringing or training as an artist. Born near Brixen in the southern Tyrol, in all probability he travelled to Mantua and Padua in Italy during the 1450s and again around 1475. His earliest known work was a 1465 altarpiece, now lost. By 1467 he appears to have established himself as a painter and master wood-carver, with a workshop in Bruneck, not far from Brixen in the Puster Valley. Most of his commissions were items of religious art, mainly altarpieces with carved high-backed figurative centrepieces, flanked by Biblical panel paintings, most of which were much larger than those seen in contemporary Flemish painting. Active for much of the 1470s in Neustift, also in the Tyrol, he moved to Salzburg in 1484 where he worked on a high altar in the Franciscan church, that remained uncompleted on his death in 1498. Unfortunately, although works by Pacher can be seen in some of the best art museums in Europe, many of his paintings have been destroyed. Of those that have survived, most are in situ, in Austrian churches. Commissioned by Abbot Benedict Eck of Mondsee, and located in the Pilgrimage Church of Sankt Wolfgang on the Abersee (the western end of lake Wolfgangsee), this Wandelaltar is one of the largest and most magnificent carved and painted altar shrines ever produced. The gilded lindenwood centrepiece depicts the Coronation of the Virgin, which is flanked by two pairs of movable painted wings illustrating scenes from the Life of Christ and St Wolfgang (Bishop Benedictine of Ratisbon). The structure is topped by an intricately carved wooden superstructure representing the Crucifixion. Most of the carved figures are freestanding and stand within a recessed space. The design is Late Gothic, with echoes of the new realism of Hans Multscher (see his Sterzing Altarpiece, 1457) in the intricate detail of the carvings. The deep linear perspective and bold foreshortening of the painted panels indicates the influence of the Mantua-based Italian master Andrea Mantegna (1430-1706), who - like Pacher - modelled his painted figures on sculptures. This altarpiece was made for the Neustift Monastery near Brixen, and - like the St Wolfgang - exemplifies Pacher's ability to synthesize sculpture and painting. The work depicts four great Fathers of the Western Church, each accompanied by a dove symbolizing the presence of the Holy Ghost. From left to right: Jerome is shown as a Cardinal together with the lion from whose paw he extracted the thorn. 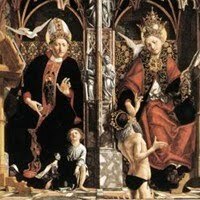 Next there is St Augustine, together with the child who reminded him of the futility of trying to comprehend the rationality of God. Then Pope Gregory the Great, who is shown rescuing the Roman Emperor Trajan from Purgatory. Lastly, there is Archbishop Ambrose, who is shown with a baby in a cradle, symbolizing an episode from his infancy. All four are set inside beautifully decorated individual recesses, which nevertheless appear to protrude from the picture plane into the viewer's space. The foreshortening of the floor tiles plus the architectural depth of the four overhead canopies creates a sense of deep perspective and lends extra volume to the Church Fathers. A combination of Gothic art (in its tracery, colouring and decorative features) and Early Renaissance art (in its linear perspective, foreshortening, and sculptural forms), the triptych represents one of the first great expressions of Italian Renaissance principles within the German tradition of painting. For a comparison with later south-German wood carving, please see the work of the mysterious Jorg Zurn (1583-1638), famous for his awe-inspiring High Altar of the Virgin Mary (1613-16), in the Church of Saint Nicholas at Uberlingen, on the northern shore of Lake Constance (Bodensee). For other contemporaneous Teutonic styles, see the Danube School, led by the Regensburg painter Albrecht Altdorfer (1480-1538), and the Franconian artist Lucas Cranach the Elder (1472-1553).